Why build a kiln in Kalalasi? Deforestation and the attendant water shortages are a big problem. Wood is the one source of fuel used in cooking and firing pots. The traditional methods are very wasteful. 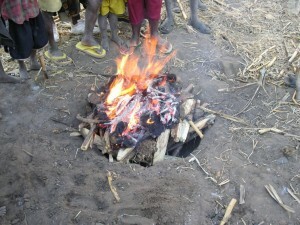 Food is cooked on a camp fire and pots fired under a bonfire. With I.T.D.G.’s ‘Better Bonfire Kiln’ they can fire pots and Upesi cooking stoves using less wood. This kiln is not only more efficient thus helping the environment; it also permits the firing of a wider range of pots, rasing women’s productivity and empowering them economically. We first had the fundraising activities; car boot sales, garden party, sponsored haircut, and so on. Then we had the logistics of seeing who wanted to go, buying tickets and getting inoculations and malaria tablets, and the interesting but hard trip to Kalalasi. The building of the kiln itself was relatively straightforward, thanks to I.T.D.G’s excellent plans, and the hard work of many villagers. The trip involved much more than that, especially a Kalalasi pottery workshop. The women liked the glazed pots we brought and wanted to share their skills with us. Their pots are used in cooking, as musical instruments, as props and in rituals.